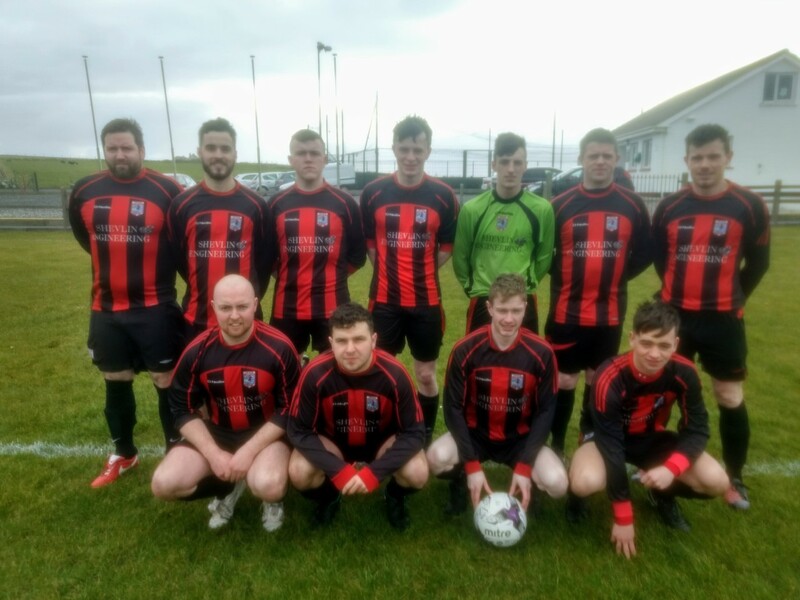 Erris United began life back in the Premier Division of the Mayo League on a winning note against Kiltimagh/Knock United at home on Sunday 24th March. Iorras Aontaithe, started life in the Premier League on a winning note. These two sides had the misfortune of been relegated from the Super League in 2018. Iorras under new Player/Manager Eamon Carey looked the better side all through the game, which was played in a blustery cold wind. The home side were in front on 25 minutes from a header from Brendan Nallen, Kyle O’Reilly provider. Erris could have added to that lead three minutes later but Pete McArthur’s effort shot wide. It remaind 1-0 at the break. Brendan Nallen, two for Erris each side of the half. The visitors began the second half with urgency and were back level ten minutes in from Simon Jordon but two minutes later Pete McArthur provoded a great cross for Kyle O’Reilly to head home at the far post. Kyle O’Reilly, a great headed effort to make it 2-1 for Erris. Brendan Nallen made it 3-1 from the penalty spot on 75 minutes and with the clock ticking down, Dylan Walker made it 4-1, the final score. Premier League table on after day one. Erris are away to Glenhest Rover on Sunday 31st in Soler21 Park in Castlebar with a 11.30am kick-off. Iorrais Aontaithe Erris united will hold their registration evening in the Club house in Carne Nash on Friday 15th March 2019 from 5.30pm to 6.30pm. 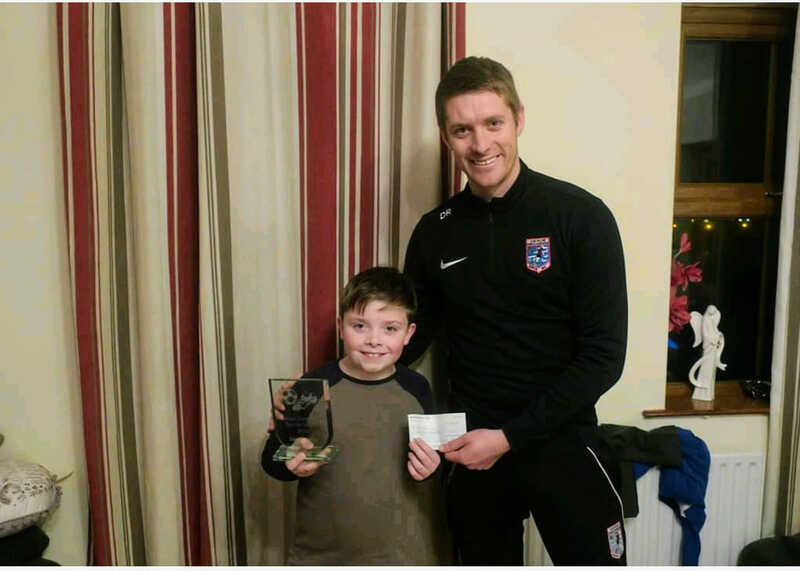 Sean Reilly receiving a cheque & trophy for 500 euro, the top prize in the Erris United Sports Genus competition (2018), from club Treasurer David Reilly. The fundraising competition tests your knowledge on a wide range of sporting events ( predicting the winners) over the year. Sean is son of John & Sadie, congrats and well done Sean. 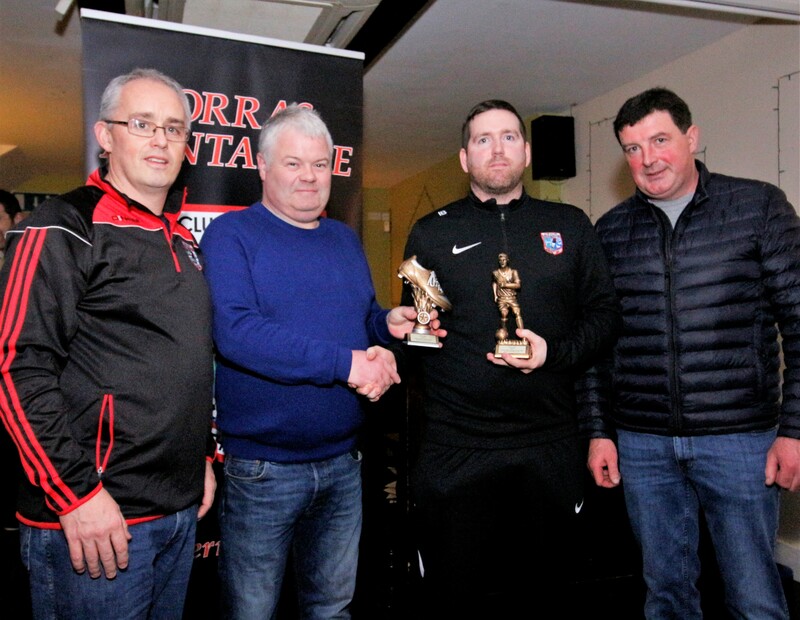 Erris United held its annual awards for the 2018 season in the Clann Lír Bar in Belmullet on Friday evening the 25th January. The M.C. was youth Coach Des O’Connor and the award sponsor was McNulty Coaches/ Transport. Congratulations to all the award winners and they were: The Golden Boot winners were for U12- Fionn O’Donoghue. U13 & U14 Josh Carey. U15 – Eoin Walsh. U16 – John Ginty. U17 – Dara Padden. U18 – Dylan Walker. The Player of the year awards went to: U12 – Declan Coyne. U13 – Kyle Hefferan. U14 – James Lavelle. U15 – Darren McDonnell. U16 – Billy O’Connor. U17 – Niall Murphy. U18 – Owen McHale, Junior Team, Young Player of the year went to Johnny Harding. Junior Team Golden Boot & Player of the year was Ivan Barrett. There was a special presentation to Molly O’Connor for the Mayo Gaynor Cup Team 2019 & Connaught Schoolgirls Team 2019. 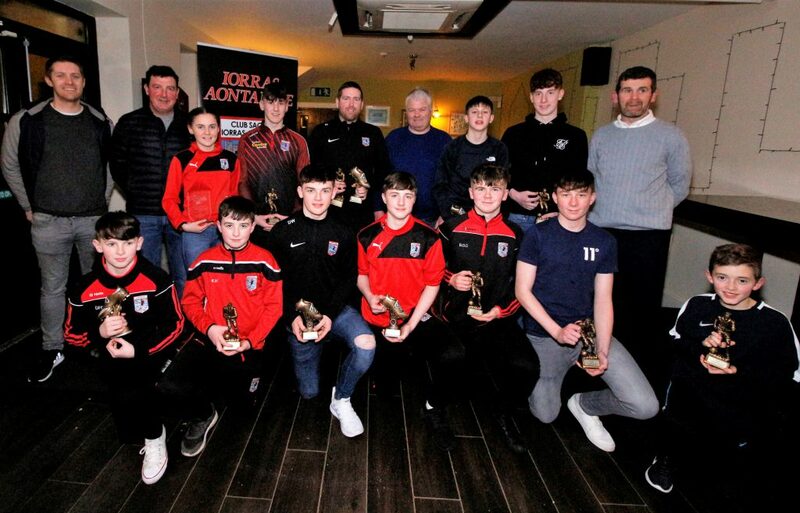 The Club wishes to thank Derek McNulty & Family for their continuing support of these awards, to the Club Coaches/Managers/Committee for their dedication/ commitment/efforts, and to Martin McIntyre for the refreshments. Iorras Aontaithe is still chasing their first points of the new season after they went down 1-4 at home to Manulla on Sunday 8th April. The visitors were in front on three minutes from a Lucas De Paula free from just outside the area but five minutes later Nathan Reilly levelled for Erris from a Tom Ivan free. But on 35 minutes Lucas De Paula had Manulla in front again with a nice finish from inside the area. It stayed 1-2 at the break. In the second half, Erris pushed for the equaliser but poor finishing let them down, Brendan Nallen on 59 minutes, Pete MacArthur on 59 minutes and Kyle O’Reilly on 60 minutes, but De Paula was just a whisker away from a hat-trick when his effort went wide of the post on 63 minutes. 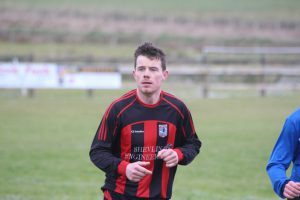 Manulla scored their third goal on 68 minutes when Chris Maughan found space on the edge of the box and Declan Tonra made it four for Manulla on 75 minutes. 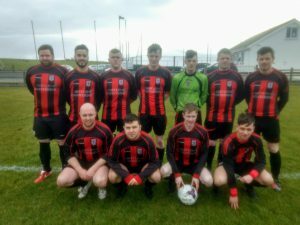 Erris are away to S.& F. Utd in the Westaro Cup on Saturday 15th April. TEAM- Shaun Noone, Nathan Reilly, Diarmuid Healy, Liam Donoghue, Micheal Meeneghan: Anthony Mills (Capt. ), Tom McAndrew, Brendan Nallen, Pete MacArthur: Kyle O’Reilly, Tom Ivan. Subs Used in the second half- Aran Reilly for Tom McAndrew, Steven Cawley for Diarmuid Healy, Steven Nallen for Micheal Meeneghan, Edward Dean for Nathan Reilly, Aran Carey for Pete MacArthur. LESSONS LEARNED AWAY TO THE CHAMPIONS. The Premier League champions Iorras Aontaithe made the long journey to the home of the Super League champions Westport United on April 1st. Iorras started on the front foot but costly mistakes were punished by a clinical Westport side, scoring 3 goals in a 15 minute period. Iorras were unlucky not to get a goal back before the break after Tom McAndrew hit the underside of the crossbar with the keeper stranded just before half time. After the break Iorras got a foothold in the game with substitutions playing an important part. Westport grabbed another goal before Iorras pulled a goal back through substitute Jason Boylan, who rounded the keeper and finished calmly into the net. Westport capitalised on a defensive error to make it 5 before Niall Geraghty had a shot cleared off the line from a corner. Westport then finished the scoring in the last minute of the game. Final score Westport United 6 – 1 Iorras Aontaithe. With a 2.30pm kick off. Team: Paul Reilly, Michael Meenaghan, Brendan Nallen, Niall Geraghty, Diarmuid Healy, Anthony Mills, Tom McAndrew, Nathan Reilly, Kyle O’Reilly, Ryan Ruddy, Tom Ivan. Subs: Jason Boylan, Dylan Walker, Ryan Gaughan, Pete MacArthur, Aaron Carey, Stephen Cawley, Tony Conroy. Comments Off on LESSONS LEARNED AWAY TO THE CHAMPIONS. Erris United went down 2-3 in their opening Super league encounter at home to S & F Utd on Sunday 25th March. The visitors went In front on 25 minutes from a Mick Guilfoye effort but Erris were back level five minutes later from Pete MacArthur after good play from Kyle O’Reilly & Tom McAndrew. The visitors conceded a penalty right on halftime which Ryan Ruddy converted to leave it 2-1 at the break. After securing all three points away to Westport Utd (B) on Saturday evening the 15th Iorras are away to near neighbors, Bangor Hib’s on this Saturday evening the 22nd, ko 6.30pm. In the Divisional Cup competition (Tuohy Cup) Iorras are drawn at home to Kiltimagh/Knock Utd on Sunday 30th April. 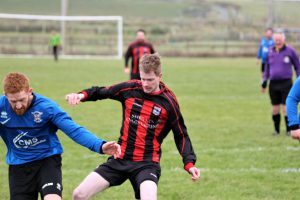 Iorras seal win in Westport with late dramatic penalty! It certainly was the late late show on Saturday evening in the sport park when Iorras secured the 3 points in a very close and entertaining game. Westport (B) led 1-0 at the break following a mix up in the Iorras defence in one of very few attacks by the home team. Iorras spurned the chance of an equaliser from the spot also. The second half saw Iorras go in search of the elusive equaliser, but found the Westport defence in no mood to concede, indeed they could have extended their lead after hitting the woodwork twice. Last few minutes, the away side threw everything at Westport and eventually after a series of corners from Tom Ivan, he found Brendan Nallen at the far post who drove a bullet header past the Westport keeper. Point saved, cue the celebration, but Westport poured forward for the winner, and from a Westport free kick on the edge of the box, the wall did its job and suddenly Ryan Ruddy found the ball at his feet and he took off! They finally caught him and upended him in the box. Penalty! Up stepped Nallen to finish coolly and secure the points for Iorras. Final whistle came soon after to leave the score 2-1 to the visitors. TEAM- Harry Reilly, Brendan Nallan, Micheal Meeaghan, Nathon Reilly: Tom Ivan, Anthony Mills, Padraic Doherty, Tom McAndrew, Gareth O’Malley: Jason O’Donnell. Ryan Ruddy. Comments Off on Iorras seal win in Westport with late dramatic penalty! 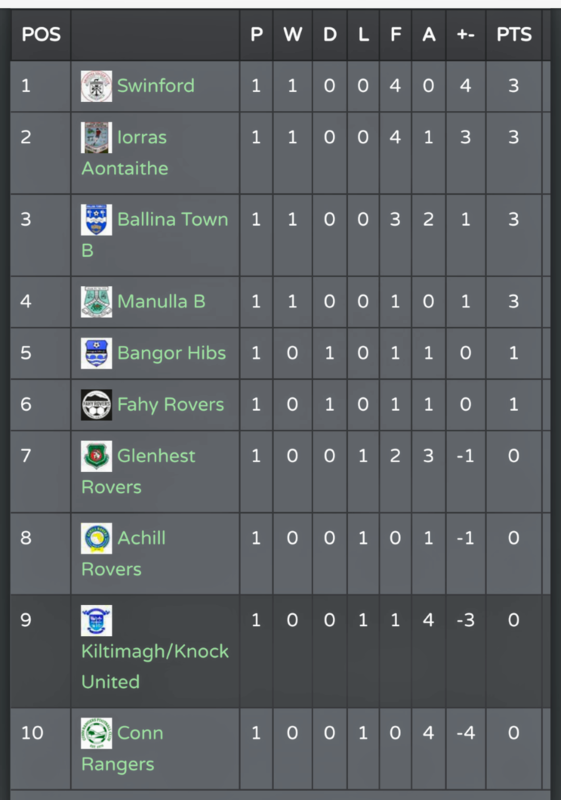 Iorras took all three points away to Crossmolina in the Premier league on Sunday 9th, Ryan Gaughan with the only goal (0-1). Kyle O’Reilly was added to the growing injury list (ankle) along with Eamon Carey (ankle) & Keeper, Niall Duffy (wrist). Get well soon to all. 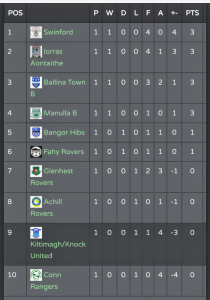 The Erris Under 15’s are finding out the hard way just how difficult life is in the Premier League. They made the long journey to Kiltimagh Knock and spent the first fifteen minutes in their own half. After half an hour they were two nil down and it was shaping up to be a very long evening. However, the home crowd were stunned into silence when Cillian Reilly scored a goal for the ages. Dara Dixon cut back a cross to the edge of the box, Cillian flicked it up and volleyed it over the keeper. Outstanding. Connor Barrett forced a great save from the keeper, Daithi Cosgrove had a mazy run that was thwarted on the goal line and there was a bit of a goal mouth scramble near the end. Other than that it was all Kiltimagh Knock. Fiachna Barrett was magnificent in goal and was presented with the man of the match award. John Ginty and Billy O’Connor displayed great composure at centre back, with plenty of last ditch tackles and goal line clearances. This was another massive display from Erris. The strength in depth of the K and K squad could be seen with 15 minutes to go when they brought on an Irish international player as a sub. Erris couldn’t force an equaliser and it finished them 2 us 1. Erris showed great skill and determination to stay in the match right up to the last kick. In fairness, if we had got a point someone would have phoned the Guards. We needed a miracle, and even though we were in the right place for one, it didn’t happen. Manager Des was delighted with the cohesion showed by Erris and the support they gave to each other. Iorras U-13s started their 2017 campaign away to Straide & Foxford this evening and were unlucky not to come away with a share of the points. The new look team saw keeper Rhys in brilliant form with numerous saves that kept Iorras in the game to the very end. Captain Eoin along with his defence of Charlie, Martin and Rory battled hard all evening to keep the lively attackers away from our goal. The midfield of Riain, Molly, josh and Oisin were making their presence felt and were able to get forwards Lenny and James in on goal, but the Foxford keeper was equal to anything thrown at him. 2-0 down at half time, manager Lenny unleashed the super subs of Troy, jack, Flynn and Kyle and they injected more energy into the team, eventually seeing josh get a goal back, with 10 mins left. Foxford upped their game, but goal line clearances from Eoin and Kyle, and exceptional goalkeeping from Rhys kept the score line the same. Iorras lost Charlie to a leg injury late on, and he was not happy to be leaving the field for attention. Last few minutes, Iorras piled on the pressure, and some pinpoint corners were brilliantly delivered by Lenny, but alas we could not convert them and Foxford survived a late penalty scare(ref didn’t give it) and held on to win it. Managers Lenny and Harry were delighted with the teams attitude and performance right to the final whistle and look forward to next weeks clash at home to Castlebar. Thanks to driver Leo, but apologies to Derek, never saw them sneak the pringles……..